I often host clubs, committee meetings and speakers in my home. The standard refreshments in our community are bought or homemade cakes, soft drinks, bottled water, packaged “snack” foods, fruit, and nuts. I prefer not to buy the prepared foods both because of health and cost. There are almost always leftovers, and I don’t want the family to eat them. I happen to love potato chips and will eat them when offered. But I always regret it, and find I don’t sleep well after indulging. I figure I’m not the only one who appreciates healthier options. My other problem is that as much as I preach about planning, when I make my grocery list I usually forget I am hosting soon. So I get stuck either buying in a more expensive store or having to make do with what I have. Necessity is the mother of invention so I’ve come up with options for refreshments from foods I usually have on hand. Homemade cake, cookies, or muffins. Popcorn. You can flavor it with grated cheese, hot pepper or other spices. Store raw kernels in the freezer. If you don’t have a popcorn maker, pop them in a saucepan with a cover. Avoid the microwave versions. Nuts or seeds. These can be kept in the freezer to have on hand. Cut-up vegetables. Serve with soft cheese, salad dressing, or chumus. Regular readers won’t be surprised to learn I don’t buy bottled mineral water. It’s bad for the environment, and its quality is not regulated to the same degree. I don’t filter tap water, either. Some people don’t like the taste but I am used to it and even prefer it to Brita-filtered water. And the minerals in tap water are good for you. I particularly dislike buying and serving diet drinks. For a short meeting (as opposed to a meal) most will be left and I don’t want it in the house. I’ve been known to offer the remainder to guests who enjoy it. If you do serve bottled drinks frequently, keep a supply on hand. They keep for months, if not longer. Tap water in a pitcher. 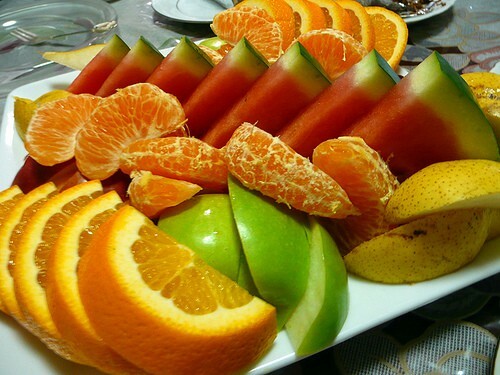 Add slices of lemon or orange to make it more elegant. Fresh lemonade or orange juice. This requires squeezing a lot of fruit. Water flavored with a smaller amount of fresh juice. I see they even sell it that way now. Smoothies are a special treat. All you need is fresh or frozen fruit, ice cubes, and milk or yogurt. I’m looking forward to hearing more ideas from readers. I also forget to buy things for the shiurim when I host them. So I try to keep nuts and seeds, frozen homemade goodies and one bottle of soda or cheap juice in the house. I find that most people won’t care if you put less food. Many, myself inclused, are happy to have less in front. Put 3 or 4 handfuls into a plain brown lunch bag. Fold bag over twice, place in microwave folded side down. Pop on regular popcorn setting. Enjoy with your own mix of seasonings and spices. My newest favorite is Old Bay Seasoning-it is a very intersting mix of celery salt, paprike and it has a kick to it as well. we always do popcorn, yes made on the stove, and we love our tap water up here! Tikva, tap water is the best diet drink. I also make iced tea from herbal tea bags. Very little to schlep home, tastes good, very inexpensive. Substantially less effort than squeezing oranges or lemons. Admittedly not as good as that, but much cheaper and much easier. I haven’t been able to adapt to tap water, so we get bottled water in the giant jugs (delivered) – it’s more ecological as the giant jugs are reused, and since I will dehydrate or drink junk (sodas) rather than drink tap water, and brita water actually nauseates me, it’s a luxury we’ve decided it worthwhile. Leah, good suggestion and you can dilute it more than recommended if you like. Soup might be appreciated, especially a thick soup that is unlikely to swish around a lot and spill. Or a cold soup if people are worried about spilling hot soup. Soup is pretty inexpensive. Nuts and dried fruit are expensive!